After months of huddling indoors while the winds of winter pounded the sides of your home, the first rays of spring are starting to shine through the gloom. This offers your family an early opportunity to head outside and enjoy the fresh air, sunshine and colorful flowers of the season. There's no better place to celebrate spring than your local park, so here are a few great outdoor activities for you and the kids to enjoy. For a simple weekend event that doesn't require much planning, consider heading to the park to break in the playground equipment. Between the swings, slides, seesaws, monkey bars and ladders, there are numerous ways to have fun with your little ones while getting in a light workout. Interested in spending a relaxing afternoon under a shady tree in the park? Consider packing some lunch supplies for the trip! Grabbing a classic checkered blanket along with deli meats, bread, fruit, vegetables and a pitcher of iced tea can make for a delicious family picnic. You can tour the various areas of the park and the surrounding neighborhoods from the seats of your bikes for a wonderful early spring adventure. 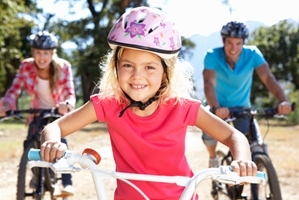 Not only is this an enjoyable activity that the whole family can participate in, but it can provide some much-needed physical activity after a winter spent mostly indoors.